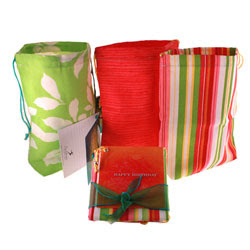 Check out these adorable little bags AND they are earth friendly! Wouldn't they be perfect to give with bridesmaids gifts or just fill with goodies for your out of towners (also in blue and green). They are called the traveling bag because you note who had it before you. These are found at Celery Street.